It has been said that casting is directing. The right cast will work out many a kink, but a bad choice in a key role cannot be made good by any stagecraft. So it is with director Greg Vinkler’s well-acted, handsomely mounted version of what Tennessee Williams called his “love-play to the world,” which is marred by the choice of ensemble member Eileen Niccolai as Serafina Delle Rose, the Italian-American seamstress and widow who is the axis of the drama. It’s an error with serious but not fatal consequences, diminishing the show’s still-considerable force and altering its tone in subtle but significant ways. As envisioned by Williams, Serafina is earthy and smoldering, her sensuality half-smothered by a life-denying combination of piety, pride and a protracted, theatrical grief. Niccolai, a performer of presence and comic ability, is simply the wrong type for the part, making it difficult to believe her claims of past sexual rapture with her husband, as well as her ultimate amorous rebirth when she meets hunky truck-driver Alvaro Mangiacavallo (played with disarming cluelessness by Nic Grelli). 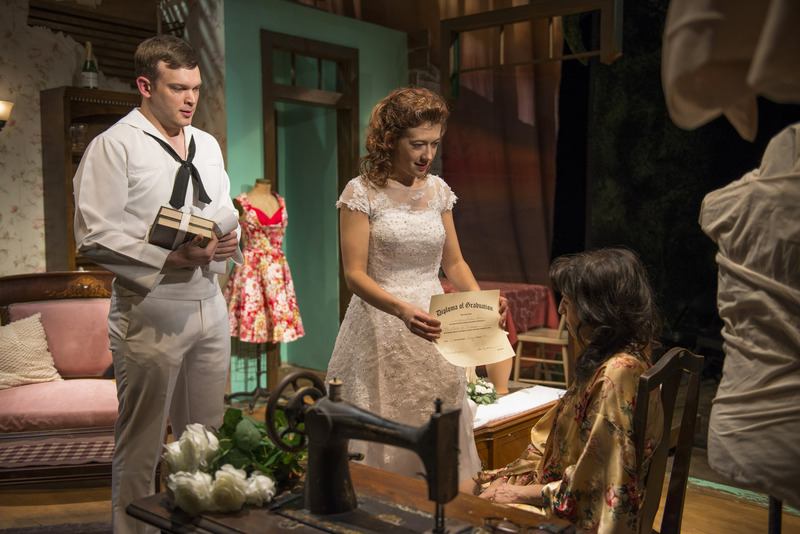 The rose tattoo that recurs throughout the play symbolizes the biological imperatives inscribed indelibly in human flesh–impulses that the actress does not fully convey, thus shifting the play’s balance between romance and comedy. As usual with Williams, the theme is heart versus head and reality versus ego-sustaining illusion. To celebrate the graduation of her daughter Rosa (Daniela Colucci, in a fiery and convincing performance), Serafina keeps trying to give her a wristwatch, when all Rosa wants is space to grow up and be with her sailor boyfriend (Drew Schad). The never-delivered watch, with its mechanical tick-tocking heart, is one of many metaphors that enrich this baroquely lush comedy, the last product of the playwright’s fertile early period. Shattered Globe Theatre at Theater Wit, 1229 West Belmont, theaterwit.org, (773)975-8150, $33 with some discounts. Through February 28.